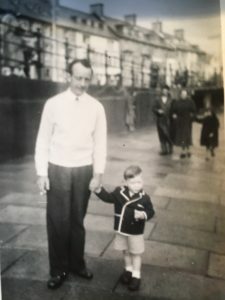 It’s worth looking up, if only for the family photo of a very young Syd (still then known as Roger) with his father, Max. Syd’s niece Ginny wrote to me, “I love the photo of Max and Rog; Rog’s hand on Max’s arm seems to be in a firm grip”. It does indeed. And since in the piece I also mention my own dad, here’s an early photo of me with a similarly firm grip on him, on what looks like a typically damp summer’s day in South Wales, with the very young me appearing to be channeling Norman Wisdom.